When you’re just getting started the cost of a website can seem massive. In fact, when you’re working hard to grow your business even a revamp to keep your website up-to-date can cause a sharp intake of breath. Isn’t there a lower cost alternative? The answer is, of course, ‘yes’; there’s always a cheaper way of doing things. Unfortunately, the less you pay the less you get and many people come to regret taking the cheap and cheerful option. There are a number of elements that contribute to a website that is likely to be found and then retain the visitors long enough to persuade them to get in touch. These are the core activities and a thumbnail of their impact on your online success. Without a proper design your website will look amateurish and may cause your visitor to disappear quickly simply because they think you don’t look like a ‘proper business’. Some of the cheaper options offer templates already created that you just put your own copy into, but the problem is that many other people will be using the same template and the search engines immediately relegate your ranking down the list because of it. A template may not allow you to present your message in a way that your visitor can relate to and is usually pretty inflexible, unless you have a developer who can ‘break’ the template and make it look the way you want. People often confuse design and development. Design is making it look attractive; development is making it work! If you’re using a template system you may not need a developer, but you probably won’t be able to do much with the site when it’s finished. 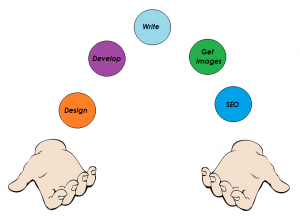 Professionally written website copy will work hard to persuade your visitors to take action. Copy you’ve written yourself is probably not going to do as well (unless you’ve studied commercial copywriting). This alone is the biggest thing that people economise on – and then are often disappointed in how their website performs – simply because the message isn’t making an impact and engaging visitors. When you do-it-yourself you’ll need to supply images. We know of at least one company who ended up paying £1,400 for using a copyrighted image on her blog. She had no idea that the image carried a copyright as she found it on Google images (farmed from another website – who had paid the fee for its use). Not knowing is not an argument to get the fee dropped. It’s the responsibility of the user to ensure that images they use have permission attached. Images can cost a lot or a little, depending on where you get them. They can also be boring images in use on many other companies’ websites and marketing materials. With a good designer you should be able to get really good images at a reasonable cost. The dreaded search engine optimisation is the magical art of ensuring the search engines sit up and take notice of your website. There a number of simple things that can be done to improve this – but cheap and cheerful sites usually don’t offer them. Improving your ranking can be done behind-the-scenes with the right tags and titles. Improving it even more requires a professional copy expert who can create specific and relevant content that supports your key words. A word about keywords: there was a time (several years ago) when the search engines responded to pages stuffed with keywords. This meant that the content was often quite clunky to read for the human visitor, but definitely got the site high in the rankings. Today the search engines are much more sophisticated and read contextually (almost like we do), so keyword stuffing is actually going to lose you ranking points rather than gain them. Keywords still need to appear, but not in every line or even every paragraph. Well put-together copy written for both human and search engine is worth its weight in gold. Quite simply you get what you pay for. If you choose a cheap and cheerful website don’t expect too much. At best it will be a very temporary stopgap, but is unlikely to be successful when it comes to getting found in searches.